If you’re an avid skier you’ll know it can be a fun and hugely exhilarating pastime. However, skiing can also be classed as an extreme sport. And for good reason too, as not many of us prepare for the physical demand that skiing places on the body, meaning that injuries are common. Here, Consultant Orthopaedic and Trauma Surgeon Mr Sam Oussedik explains what the most common ski injuries are, and how you can prepare yourself for ski season — to help reduce your risk of injury, so you can look forward to your next adventure on the slopes. What are the most common skiing injuries? 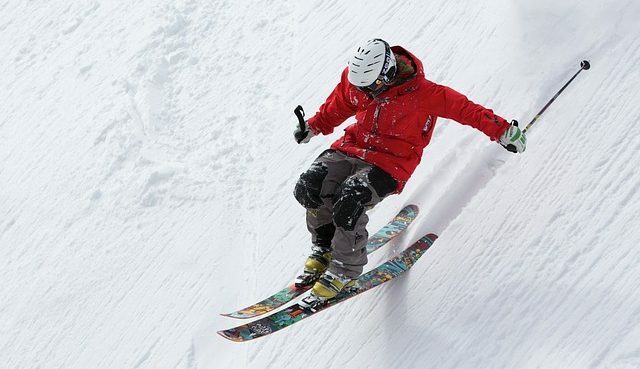 The knee is the single most common joint affected, accounting for around 1 in 4 ski injuries. The most commonly damaged parts of the knee are the ACL and MCL — ligaments that attach your thigh bone (femur) to your shin bone (tibia) within your knee joint. The pads of cartilage that act as shock absorbers within the meniscus of the knee joint are also commonly affected. Knee injuries occur so frequently during skiing because of the nature of the sport. They usually happen as a result of catching an unexpected edge with your ski. If the binding keeping your ski to your ski boot fails to release, your body weight and speed then create a lot of energy through the tip of your ski. The length of your ski then acts like a lever, forcing your knee to twist, potentially causing significant bone and ligament damage. Skiing accidents can also cause breaks and fractures to the lower legs, ankles and feet. If you’re about to fall when skiing, often it feels automatic to put your arms out in front of you to break your fall. Doing this causes the impact of the fall to travel through your arms and can cause injury to your shoulder. And, this can be anything from a sprained shoulder, dislocation, to bone fractures. A broken collarbone, or clavicle, is also a common injury from falling. The natural instinct to put your arms out if you fall, also puts the wrists at risk of injury. They’re often the first point of the body to absorb the impact of the fall. If you fall and land on your hands while still holding your ski pole with its strap, it’s common to suffer something called skier’s thumb. This is where the thumb is sprained or dislocated. Skiing also poses a risk of serious injury to the head, face and neck. Wearing a dedicated ski helmet (as opposed to a cycling helmet) significantly reduces your risk of serious head and brain injury. Common head injuries include whiplash and concussion. What are the main causes of ski injuries? Although a ski injury can happen to anyone, the risk of injury is higher in those who haven’t received professional training. Those who rent rather than own their ski equipment, and those aged between 35 and 50 years old, are also at a higher risk. How can I prevent ski injury? Physical fitness — skiing is a physically demanding sport, so maintaining a good fitness level before you ski is essential for reducing your risk of injury. Performing exercises that help to condition your body and core muscles can help to prevent injury, but it’s important to follow the advice of your GP. If you experience any pain when exercising, stop and seek the advice of your medical professional. Ski lessons — if you’re a beginner or you haven’t skied for a few seasons, then make sure you take professional ski lessons. Even experienced skiers can benefit from lessons. They help with your confidence as well as your technique, and can also teach you how to fall correctly in order to reduce the risk of injury. Skiing to your ability — whether you are new to skiing or not, make sure you stick to the safest run that’s within your ability. Only move up when you’re absolutely confident to do so and well-practised. Warming up — as with any exercise, physically exerting yourself with cold or stiff muscles can cause an injury. Starting your day on the slower runs is also a good idea, no matter how experienced you are. Have the right kit — if you’re hiring ski equipment, make sure it fits properly and that your skis are the right length for you, your skill level and where you intend to ski. Only ever use hire shops that properly measure you for boots, skis and poles. If you have your own equipment, make sure it’s well maintained. Wearing layers of clothing designed to be water and windproof will help keep you warm. Use protective equipment — items such as wrist guards and pads for the elbows and knees can help protect your joints. A ski helmet is a good idea to help reduce your risk of injury. Don’t ski when you’re tired — injuries are more likely if you haven’t had enough rest, or you’re keen to squeeze in one last run at the end of the day. Dehydration can also cause tiredness, so make sure you’re properly hydrated throughout the day. Don’t consume alcohol and ski — not only are you more likely to become dehydrated and tired on the slopes, drinking leads to recklessness and accidents because your judgement becomes impaired and you take more risks. Observe signs and warnings — stick to areas that are marked as safe and don’t veer off track or onto dangerous terrain. Have a skiing partner and avoid finding yourself on your own. Learn how to use the lifts properly — familiarise yourself with the lifts and don’t take unnecessary risks. How can I get treatment for my ski injury? If you do get injured when skiing and need medical treatment, the safest course of action is to be seen as soon as possible following your injury. Even if you are still on your ski holiday, this can help prevent potential further damage. Any medical diagnosis should be made by a trained specialist. This can involve a combination of careful examination, x-rays and MRI scans where necessary. It’s usually possible to travel back to the UK with your injury, where you can seek definitive diagnosis and treatment. If you have a broken bone however, it’s best to have the break stabilised before travelling.